Q1. What makes a news magazine on @Flipboard worthy of following? A news magazine is worthy of following if it gives you info that’s new to you, from reputable sources. Two important criteria to be worthy: Covers an important news topic well; offers general news from good sources. Relevant topics; high-quality images. Been gathering news about my school district in a magazine. Timely updated news is a must for me. Requires real commitment on part of mag maker. Legitimate sources and staying up to date. I value a point of view/certain take on the news or issue. I think recent updates are important too. Interesting, content that resonates with me + aligns with my personal interests or mag topic(s). Flipboard news mags bring me the news in a way other media do not. With @Flipboard‘s great visual elements! Q2. What should curators consider when choosing news sources for @Flipboard magazines? It’s crucial to have reliable sources that have vetted their sources. News orgs have tools to do that. Look for 2nd, 3rd, and 4th source. Make sure everyone’s not citing the same. If it’s about a breaking story in particular — quality. That includes writing, sourcing & thoughtfulness. You want reliable news sources, not click bait style operations. Bloggers are a great resource for news too! Trustworthiness, reliability and timeliness. If you’re not sure, check their website and social accounts. Q3. When news magazines cover similar topics on @Flipboard, how do you make yours stand out? You can make your own news mag stand out by taking a particular angle or part of the story. Take a particular POV. It doesn’t have to be partisan, though. Maybe eyewitness accounts. Or social media reactions. I also like magazines that show the history or backstory of a particular issue. I think the best way to make your news mag stand out is quality and accuracy. And having a solid niche. A school news mag would have content, images etc particular to its school. Easy it to stand out with target audience. Unique focus. Drilling down to make it a niche mag. News is just too big. Specialize! Build a reputation of both quality and timeliness. On Flipboard in particular, use good visuals on articles. Q4. Any advice on choosing cover photos for news magazines on @Flipboard? Should you even set a cover? Yes, to setting a cover, but can be changed frequently. Unless a single pic represents the heart of the story. Along with being hi-res & relevant, I’d also say timely. It should illustrate a current event (or iconic if history mag). Definitely set a cover! Make sure its one that represents your mag content appropriately and also draws readers in. Your cover is the front door to your mag, make sure it appeals. Could be rotating cover based on latest news. I try to pick an image that will hold for awhile. I have decided to set my covers, the only to guarantee quality images. If it’s a mag on an ongoing event, change the cover to reflect the current situation. For some mags for a news event, cover can stay forever, like with Charlie Hebdo story. Compelling, hi-res image, different than what everyone else is using so you stand out. Q5. What is the best way to promote a @Flipboard news magazine to build readership? Definitely #FlipboardFriday! Also, look up the event’s hashtags and use it when sharing on social media. Headlines that include keywords help it get picked up within the app. Using your own social networks too! From my view social networks FB, Twitter and linkedin and you need to be consistent with it. Do what @TechCrunch did. Add the +flipit button on your site to welcome @Flipboard curators to share your content. I also add link to mag in my email signature, when promoting education related mags. Q6. What is your biggest challenge when curating a @Flipboard news magazine? One big challenge is keeping up with all the news when there’s a breaking story. With breaking news, balancing flipping new stuff with taking the time to vet sources. Another big challenge: Staying interested when story goes on and on and on and its 15 minutes are way up. Q7. What is your advice for news teams collaborating to co-curate @Flipboard magazines? Divide and conquer! Decide who flips photos, articles, etc. Divvy up sources so there’s no overlap. Communicate. Decide on a magazine scope and let contributors provide their own perspectives within that framework. They can amaze you! Use private group magazines to share and preview content ideas with the team. Q8. What are your best tips for keeping news magazines fresh for @Flipboard readers? Follow Flipboard Topics! Also, follow reputable accounts and hashtags. Save feeds in private mags. I make sure I get alerts for topics I’m curating for news mags. You’ve got to flip often and remember with apps like Periscope and Meerkat and Instagram that people are constantly sharing. Choosing to curate about stories that truly interest you means keeping up will be fun, not a chore—that helps. Fresh content is only as good as the sources. I collect sources on various social sites and pull from each! Follow the people involved & reporting too. 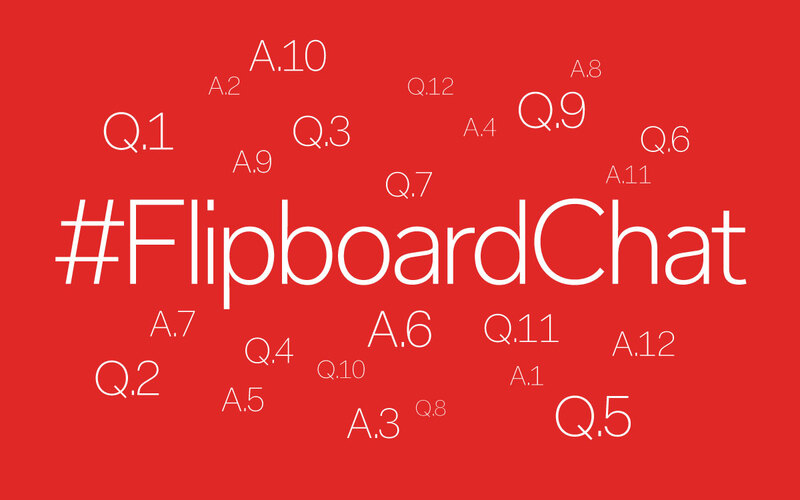 Don’t forget to join the #FlipboardChat this week: the topic is “Using the Flipboard Editor.” Start chatting on Twitter on April 8, 2015, at 7pm PT / 10pm ET, or come back to this blog for an update.